If you have any information about these crimes or any person(s) involved, you are urged to call Crime Stoppers at (903) 577-TIPS (8477) or submit a Web Tip. You do not have to give your name. CRIME STOPPERS will pay a cash reward of up to $1000 and you can remain anonymous. 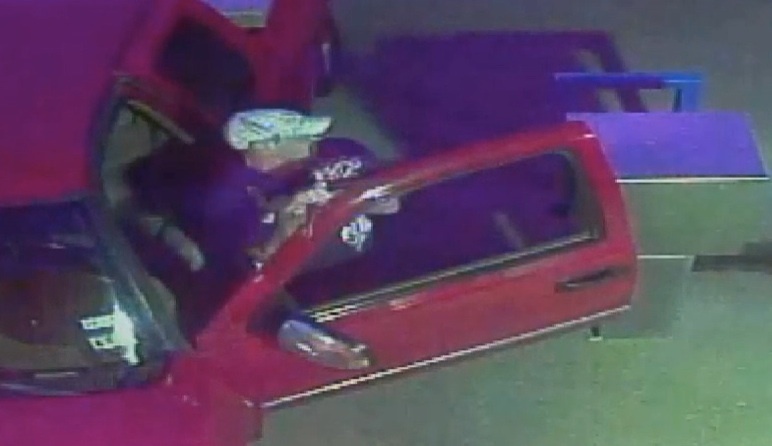 The Northeast Texas Area Crime Stoppers needs your help with this weeks Crime of the Week. On the evening of December 28th, 2018, at about 11:01 P.M. Mount Pleasant Police Officers responded to a report of a robbery that occurred at a Dollar General store (1124 North Jefferson Avenue) in Mount Pleasant. During the investigation it was determined an unknown black male, wearing a gray hooded sweatshirt, jeans with a design on back pockets, about 5’5 to 5’6 in height, and black and red shoes robbed the store. The suspect presented a firearm and followed the employees working at the location around as he made his way to the safe, where he filled a store bag with money and left. The suspect is reported to have been on foot. This suspect is possibly linked to another robbery that occurred at Security Finance on the morning of 12/22/18. 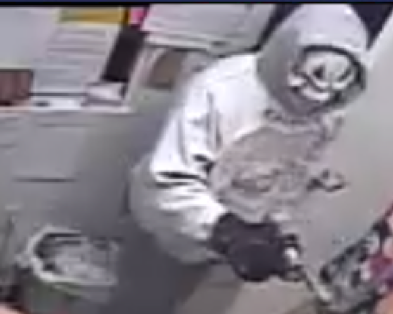 In both cases, the suspect is wearing a similar mask and displays a gray revolver, about a 6” barrel. Be cautious, the suspect is considered armed and dangerous. If you have information on this robbery, please contact the Northeast Texas Area Crime Stoppers at (903) 577-TIPS (8477) or by clicking "Submit a Tip". Due to the seriousness of these crimes, if your information leads to an arrest, the Northeast Texas Area Crime Stoppers has guaranteed a CASH REWARD OF $1500.00. Remember, all we want is your tip information and never your name! The Northeast Texas Area Crime Stoppers and the Franklin County Sheriff’s Office is currently investigating a Burglary of Habitation that occurred at a residence located in the 1500 Block of CR 2100. The Burglary was reported to the Sheriff’s Office on October 22, 2018. Unknown subjects made entry into the back door of the residence. There were several items that were scattered along the floor leading from the kitchen to each bedroom. Every closet and dresser was gone through. There was a wallet with multiple credit cards, a 32” Vizio TV was taken. There will also be a piece missing from the TV stand. The other half of stand was located at the scene. Also there was a Ruger LPC 9MM pistol, a Remmington 270 Bolt Action Rifle, a 1911 12 Gauge Shotgun, a 22 6 Shooter revolver with a colt insignia on the pistol taken from the residence. There was also fresh tire tracks found at the scene leading from driveway to about 15 yards from where entry was made. The tracks are similar to the size of a small compact car. The Northeast Texas Area Crime Stoppers needs your help in solving this crime. Remember, all we want is your information, not your name. If your information leads to the arrest and/or the recovery of the stolen property on this or any other felony crime, you could receive a CASH REWARD of up to $1000.00. Call the Northeast Texas Area Crime Stoppers today at 903-577-TIPS (8477), submit a Web Tip via our website at www.netacrimestoppers.org. The Northeast Texas Area Crime Stoppers and the Titus County Sheriff’s Office need your help with this week’s Crime of the Week. Titus County Sheriff’s Office is investigating a burglary and theft of an ATV that occurred in the 3000 block of 3245 between October 4thand October 14th, 2018. The actor(s) forced entry into the building and once inside stole a green with a camouflage color scheme 1999 Yamaha 600 Grizzly ATV. The ATV reported having front and rear racks along with dual rifle cases. Also taken from the location were a saddle and flat screen television. The Northeast Texas Area Crime Stoppers and the Franklin County Sheriff’s Office need your help with this week’s Crime of the Week. Around August 30, 2018, unknown suspect(s) made entry into a white CM Cargo/Living Quarter trailer located at the Sulphur River Saddlery at the intersection of Highway 37 North and FM 71 East. Once inside, the suspect(s) stole approximately twenty pairs of Olathe Brand Boots and multiple pairs of Ferrini Young Gun boots, all still in their boxes. The Olathe boot boxes are described as plain white with a brown bronco horse bucking a rider on them and the Ferrini boxes are reddish/orange with a rider roping a calf. Multiple Montana brand wool lined jackets/vests were also taken from the trailer. The Northeast Texas Area Crime Stoppers and the Mount Vernon Police Department needs your help with this weeks Crime of the Week. On June 28, 2018, at approximately 4:00 AM, two black males entered the Tobacco Rhoades store in Mount Vernon, TX. The suspects smashed the front glass with a sledgehammer and once inside stole approximately 103 cartons of cigarettes. The brands of cigarettes included Marlboro Reds, Marlboro Special Blend, L&M, and Kool. The cigarettes were carried out in a black trash bag and a white hamper-style trash can. The suspects left the store and walked across the street to a local apartment complex and left in an unknown make and model vehicle. If you have information on the suspects involved in this burglary, please call the Northeast Texas Area Crime Stopper at (903) 577-TIPS (8477) or click "Submit a Tip" for an anonymous online tip. Remember, all we want is your tip information and never your name. If your information leads to an arrest, you could receive a CASH REWARD UP TO $1000.00. The Northeast Texas Area Crime Stoppers and the Titus County Sheriff’s Office need your help with this week’s Crime of the Week. Titus County Sheriff’s Office is investigating a burglary of the Crazy 8’s liquor store on the 100 block of East 5th St. in Winfield, TX. The burglary occurred between the time the store closed and was discovered upon opening this morning. The burglar, forced entry through an exterior door and once inside, are known to have committed a theft. The Northeast Texas Area Crime Stoppers and the Mount Pleasant Police Department need your help with this week’s Crime of the Week. On the early morning hours of 12/28/2017, Mount Pleasant Police Department Officers responded to a report of a Burglary at Valero, 515 West Ferguson Road. The suspect appears to have entered through the back door of the business by throwing a brick through the back-door glass. 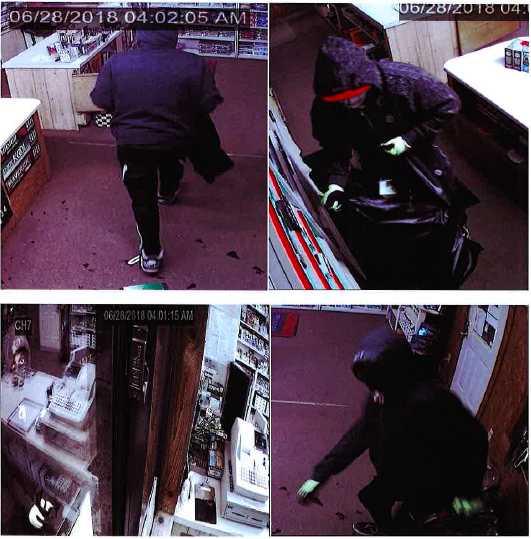 The surveillance footage shows the suspect entering the business, taking packs of Newport brand cigarettes, leaving and then approximately thirty minutes later returning and breaking into the register and cash box, taking over $600 in cash. 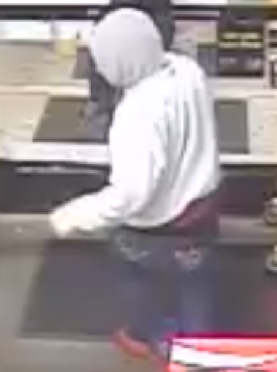 Attached are photographs of the suspect from the Valero surveillance footage in an effort to help identify the suspect, and to help provide clothing descriptions to Mount Pleasant Police Department Officers. Officers recovered a makeshift mask, a rag with eye holes cut in it, and the suspect’s glove, a black sock. The suspect was only thoughtful enough to use one sock as a glove. The Northeast Texas Area Crime Stoppers and the Titus County Sheriff’s Office need your help with this week’s Crime of the Week. Sometime between November 17 to November 21, 2017, a home was burglarized on County Road 2700 in Titus County, Texas. Once the suspect(s) entered the residence, they stole several firearms and electronics. The Northeast Texas Area Crime Stoppers and the Titus County Sheriff’s Office need your help with this week’s Crime of the Week. On or about Monday December 4, 2017, a red in color 2006 Yamaha Kodiak 421 cm3 ATV (4-wheeler) was stolen from CR 4221 in Titus County. County Road 4221 is in the Eastwood Hills area of the county. The ATV had push button four wheel drive and chrome wheels. The Northeast Texas Area Crime Stoppers and the Titus County Sheriff’s Office need your help with this week’s Crime of the Week. On October 24, 2017, unknown actor(s) stole a trailer with fencing materials from a pasture on County Road 3180 in rural Titus County. The trailer is a 16’ to 18’ dual axle Big Tex Trailer with pipe top rail and rusty diamond plate flooring. The spare tire holder on the trailer was severely bent where a tire could not be placed on the holder. The trailer contained seventy (70) 6.5 foot T-posts and multiple rolls of barbed wire fencing. The Northeast Texas Area Crime Stoppers and the Franklin County Sheriff’s Office need your help with this week’s Crime of the Week. On January 14, 2017, unknown actor(s) stole a 2008 Harley Davidson Sportster motorcycle from 1960 County Road 4350. The motorcycle is described as XL1200C Sports On May 15, 2015, unknown suspect(s) entered the construction trailer at the construction site at Hart’s Bluff School. Once inside, the suspect(s) stole a computer and electronic surveying equipment. Call the Northeast Texas Area Crime Stoppers today at 903-577-TIPS (8477), submit a Web Tip via our website at www.netacrimestoppers.org or send an anonymous tip via text by sending “NTX” plus your tip to 274637 (CRIMES)! The Northeast Texas Area Crime Stoppers and the Titus County Sheriff’s Office need your help with this week’s Crime of the Week. Between the hours of 5:30 PM and 9:30 PM on May 10, 2015, unknown suspect(s) took the bunker gear of a Tri-Lakes firefighter from the bed of his truck. Items taken include bunker pants, fire boots, bunker coat, fire hood, helmet and fire gloves. The bunker coat had “Tri-Lakes” written in yellow reflective striping and the stolen white fire helmet has “1529” written on it. The Northeast Texas Area Crime Stoppers and the Mount Pleasant Police Department need your help with this week’s Crime of the Week. On January 3, 2015, unknown actor(s) set a vehicle on fire, under the carport at a residence in the 500 block of Magnolia Street. Then, on January 16, 2015, unknown actor(s) threw a Molotov cocktail through the kitchen window of the same residence, setting the kitchen and living room on fire while the occupants were inside and asleep. The Northeast Texas Area Crime Stoppers and the Franklin County Sheriff’s Office need your help with this week’s Crime of the Week. On January 18, 2015, unknown actor(s) shot a calf multiple times on County Road 2210 in Franklin County. The Northeast Texas Area Crime Stoppers and the Franklin County Sheriff’s Office need your help with this week’s Crime of the Week. Sometime between December 26, 2014 and January 4, 2015, unknown actor(s) broke into Walleye Grocery located on County Road 4220. Once inside, they stole six flat screen televisions. The Northeast Texas Area Crime Stoppers and the Mount Pleasant Police Department need your help with this week’s Crime of the Week. The individual in these photographs is alleged to be involved in a theft/scam from an elderly female in Mount Pleasant on January 13, 2015. The scam is believed to have been carried out by two different individuals. 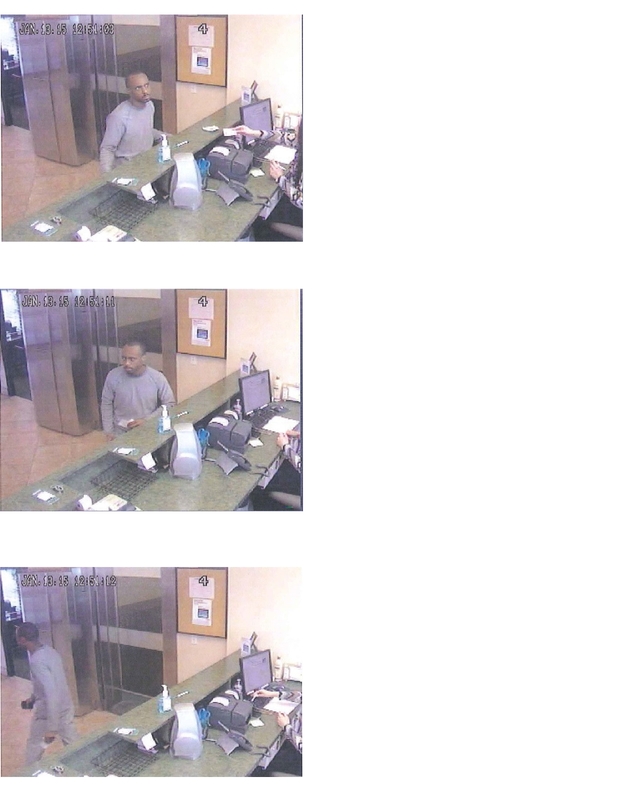 The person in the photographs attempted to cash a check, but the bank denied the transaction. The check was later cashed by the elderly victim and given to a person posing as a police officer. The second suspect involved in the scam is a tall white male, no photograph available. The tall white male involved in the scam identified himself to the elderly victim as a police officer using the name Josh. At the time of the scam the white male was wearing a black suit and displayed a badge and a set of handcuffs. The Northeast Texas Area Crime Stoppers and the Titus County Sheriff`s Office need your help with this week’s Crime of the Week. On Tuesday, August 19, 2014, unknown suspect(s) stole a welding trailer fitted with the full complement of metal working tools from a residence on County Road 1670. The trailer is described as a faded red single axle with a blue Miller Bobcat 225 gasoline powered welder/generator. The Northeast Texas Area Crime Stoppers and the Mount Vernon Police Department need your help with this week’s Crime of the Week. On July 6, 2014 at approximately 5:55 AM, two (2) white male suspects in a red GMC/Chevy extended cab truck attempted to pry open the automatic car wash pay box at Kwik Kleen Karwash on Highway 37 South next to Mt. Vernon Tire. After failing to gain access into the cash machine they gained entry into several vacuum cash boxes.